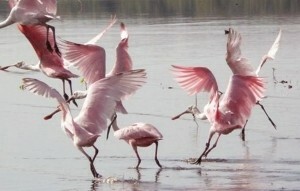 There are several reasons why the state of Florida is so popular with bird watchers. Birding in Florida contributes to the tourism economy of the area and brings in 2 million bird watchers each year. The diversity of habitat, its mix of temperate zones and its fortunate position as a point on migration routes have resulted in the documented sightings of over 500 species of birds, many of which are rare. The most famous trail was introduced by The Florida Fish and Wildlife Conservation Commission to encourage conservation and to attract visitors. Named The Great Florida Birding Trail, it runs for 2,000 miles across 489 sites. There are guide books with maps and highway signs to guide visitors along the trail. Various eco-tours like Everglades Day Safari play an important part in birding in Florida, by educating the public and touring the natural habitats of various species. The range of birds seen in the state encompasses the tiny Hummingbird, up to the majestic Bald Eagle and other hawks. Most North American birds on the east choose Florida as their winter home, just like people! On Lloyd’s Tropical Bike Tour in Key West, there is the opportunity to see Whooping and Sandhill Cranes, Osprey, Pelicans, and Roseate Spoonbills up close and personal. Birding in Florida is enjoyable throughout the year with resident birds and migratory species. The residents are spotted all of the year and migrating birds are usually seen from mid-April to mid-May or in October. Everyone can get involved with this fascinating hobby. Both state residents and non-residents can participate in Wings Over Florida, a program that awards people according to the number of different species they observe. The idea is to identify as many native birds as possible and win a certificate at five different levels. The first level is for 50 birds and the last level is for 350. This brings the competitive spirit to birding in Florida. The state bird, the Northern Mockingbird may appear on the list. Merritt Island National Wildlife Refuge, Everglades National Park, and Suncoast Seabird Sanctuary, Indian Shores. The steady flow of visitors to spot birds helps the refuges and parks to continue in their good work. Wherever bird watchers go in Florida, they are bound to tick off lots of species.